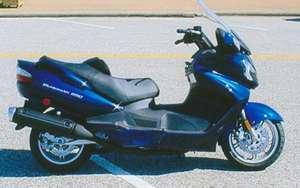 I have my cobalt blue 2005 Burgman 650 for sale that is in excellent condition. The 2005 Suzuki Burgman 650 has a 5 speed fully automatic transmission and has been ridden. This sporty scooter is no wimp and can run with the big boys. A friend of mine read it to check and had it up to 130mph which I had never done before. At normal around town speeds it gets around 45-50 mpg which makes for very cheap travel in anybody's book. The used Suzuki motorcycle for sale has a new rear tire and only 12,000 actual miles. The scooter has been building kept and is in excellent condition. I just bought a Honda Goldwing or i would not be selling it . If you're interested, would like more pics or to make an offer you can reach me by e-mail using the comments form found directly below this classified. Strike Lightning Used Motorcycles for Sale would like to offer an invitation to anyone who may be having a problem with their own 2005 Suzuki Burgman 650 to leave a description of the exact problem that you're having and your contact information in the space below and see if somebody who stops by may offer a solution for how to fix your motorcycle. We also encourage bikers to submit their opinions and reviews of the 2005 Burgman 650 for sale to help potential buyers make informed decisions and to benefit the biker community as a whole. The scooter is located in Baytown and my asking price is $4,500.